The Red Cards were created to help people assert their rights and defend themselves against constitutional violations. CRC has ordered Red Cards for distribution and they are available at the following locations on campus; Counseling, Student Life & Leadership Center, and at the Vice President of Student Services office. All people in the United States, regardless of immigration status, have certain rights and protections under the U.S. Constitution. Knowing and asserting rights can make a huge difference in many situations, such as when ICE agents try to enter an individuals home. 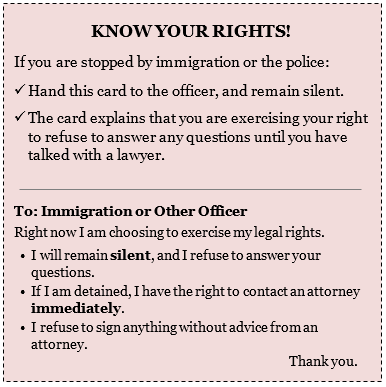 Red cards provide critical information on how to assert these rights, along with an explanation to ICE agents that the individual is indeed asserting their rights. Below is a printable version of the Know Your Rights Card. To print the card click on its image below, then press Ctrl-P on your keyboard.